I've owned this for a few years now and it has become my holiday must-have. I've used it at home, on vacation in Key West, in a NYC hotel room when I was working an assignment over the holidays a few years ago, and basically wherever I happened to be when the holidays hit. Great app. These things need more thought. Simply filming a fireplace isn't enough. There so much smoke being filmed I wanted to cough!!! Easy to use. Combine crackle and music. First review I have ever written. This app freezes ten minutes in. Additionally, will play about 4 seconds of your music before pausing it and not letting it resume. I would highly recommend another app. I love this little app - had it for years. When I go visit people in Florida for x-mad we AirPlay in the living room. The crackle sound is cool. Cannot get background music, every time you check a Message or another App it bounces off. Not worth it even it was free. Had for many years now and I love it:) Super cozy and the music is gorgeous:) reminds me of christmas. 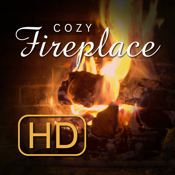 Best, Coziest Fireplace App Ever!!! Love this SO much!!!!! It's been a holiday staple for our family for years!! Does Not Support IOS 7! I should have read the reviews instead of reading compatibility (Supports iOS 5 and better). Wasted 99 cents. 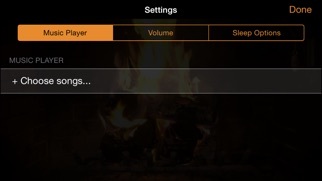 It Airplays the crackling fireplace but will crash when you toggle the music switch. Just downloaded this app and absolutely love it already!!! Love all the features also. It never gets cold here enough to enjoy a fire. Absolutely love this!! It helps me fall asleep every night. Thank you!!! Great! Very relaxing! Best 99 cents I've ever spent! It looks nice. However, it's the same 20 second video looping over and over again. After a while, you begin to anticipate the same sounds that you come to hear over and over again. It becomes a little bothersome, and instead of having a nice peaceful fire place seen, you begin to anticipate that same crackle, and pop sequence that your ear begins to pick up on. I would look around before getting this one. Using AirPlay on my iPhone 6 , it will usually cut out after 10-15 minutes and I have to restart it constantly . Great HD picture of a burning fireplace but the cutouts are annoying . Works fine on my iPad2, iPhone 4 & 5, and mates well with my Apple TV. What do you want for .99? Does a nice job. Most of us know that. Awful lot of whining over a great app that does what it says it does. These developers are nice people who will continue improving the app. Gee whiz, ask with some manners. You know who you are. I absolutely love this app. Makes my living room feel so cozy... Especially around Christmas! 5 stars when you get iPod music to work with airplay! I loved the idea of a crackling fireplace at my command. So I bought this app without reading any reviews (never wise! ), and started as soon as it finished a quick download. And it was just as beautiful as I had imagined...until I heard a gap in the sound. At first I thought it was a fluke and ignored it, but then it became apparent that the gap in sound was very regular and about every 20 seconds I'd say (I didn't time it). Thing is, I don't know that I would have caught or minded the looping if the sound didn't abruptly stop for about a second then continue at the beginning of the loop. And unfortunately, that gap is enough to disrupt the meditative state that was forming as I gazed into the fire. So disappointing and it seems that it would have been so easy to avoid the gap. It's very obvious the loop that repeats itself every 20 seconds, both audio and visual, and gets very annoying. Not worth the money. I love this app. I like to play it through my Apple TV. I also like the idea that I can pick what music I want to be playing. Like it for what it is and it works well. However wish they had more of a variety of different fireplaces to choose from like other similar apps. Short of actually setting my phone on fire, this is the next best thing. I mostly use it on the table when we go out for dinner, to class things up, and this litte fire always does the trick. As ridiculous as that sounds, it actually does provide a little novelty atmosphere. I'm not sure why there are complaints about the looping. If you relentlessly focus on this thing, then yes, you will see and hear it loop. However, I get the impression this was designed to be used in the background, and not be the focus of everyone's attention while it's running. If you downloaded this to just sit and stare at it, then you might have issues that this app isn't gonna solve. Perfect in every way. Surpasses all expectations. Have had this app a year and just love it. Feels like I am cozy next to a fireplace and the audio is the real deal too. Worth the purchase. Hey guys it's time to update the app it no longer works on an iPhone 6! App works great. No problems here. I decided on this app based on reviews I found outside the App Store. 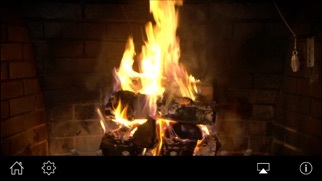 This app is nothing more than a 20 second video loop of a fireplace. No settings, no adjustments, nothing except the same repeating 20 second loop. Total waste of money. Don't fall for the reviews here unless you like dull repeating video clips. Absolutely Perfect! 🔥By, A very satisfied customer! Simply put, it's fantastic! Relaxing, soothing and so comfortable that it feels like it's really in the room with me and my little Yorkie. I have it on my iPad and iPhone! It is a must have for fireplace lovers! Great idea. Easy to use. Ugly fireplace. Please update with nicer fireplace. Idea: Maybe get some video from a Ritz Carlton or similar hotel lobby. Love the app but the new ios8 version doesn't allow me to switch directions the old version had landscape an portrait view now it's only landscape. I liked being able to have the option depending on how my phone was sitting. I love this app, but the recent update broke it for me. It plays on my Apple TV for a few minutes then stops. So I have to keep restarting it over and over. I'll increase the rating as soon as this problem is fixed. 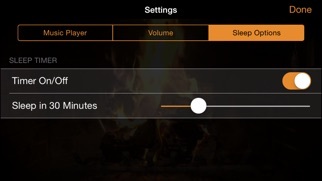 I'd also like to see the ability to select an entire playlist of songs to play while the fire is going. That would be a lot easier than adding each individual song. I have been a follower of this app since it came out and this is one of my favorite updates!! I have not seen any problems. Apartment dwellers without a fireplace with wow and dazzle their guests with an HD Fireplace with the help of Apple TV! Love it! I just purchased this app and played it for s few minutes. The fire looks like one I would have laid myself in my own fireplace. Same log arrangement. Crackling is great. I haven't played music yet nor tried to send it to a larger screen via AirPlay. I'll try that some day. ...just in time for an urban fall! I like the feel of the fireplace it has, but the music portion does not work. Also, the gap in sound for the crackles is outrageous. Fix these and the app will be amazing. Until then, I can't use it. 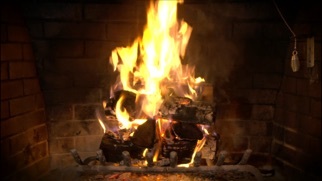 We don't have a fireplace, but having this on the TV screen via apple air, gives us that feeling. You hear the wood crackling, and you almost swear it gives off warmth. Had it for over a year and it's impressed many folks. Just plain love it! I've wanted a fireplace in our living room for years, but couldn't afford one. Now I've got one! It looks amazing on our big screen, plasma, HD TV, and I love the crackling sound. 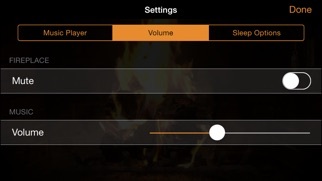 I've tried a few other fireplace apps, but none compare to this one! The philosophy behind this app is great. However, read the comments from the developer before you purchase. I have ios7, an iPhone 5s, and the newest Apple tv. It does not work well. You can't stream the video via airplay and add music from your playlists. You also cannot view the control panel....it's hidden. For .99, it's not the end of the world. Needs to be up-dated.